Northern Illinois University has selected Omar Ghrayeb to lead NIU College of Engineering and Engineering Technology as interim dean, effective June 30. 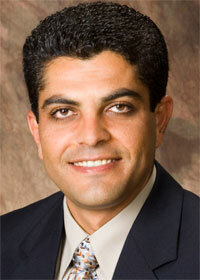 Ghrayeb came to NIU in 2001 to teach in the Department of Industrial and Systems Engineering. From 2006 until 20012 he served as chair of that department. Under his direction, enrollment in the program nearly doubled, the curriculum was updated and he established partnerships with several major corporations, including Caterpillar, Motorola and UPS. Those partnerships provided students with opportunities for experiential learning and internship opportunities while also providing research opportunities for faculty. In 2010 he took on the role of associated dean. In that position he has helped increase enrollment in the college by more than 40 percent, developed partnerships with feeder community colleges across the northern Illinois region, and restructured advising in the college. “I appreciate Dr. Ghrayeb’s willingness to serve as the acting dean of NIU’s College of Engineering and Engineering Technology. He has the respect of his colleagues in the college and across the campus for his creativity and collaborative leadership,” said NIU Executive Vice President and Provost Lisa Freeman. “Moving into the new academic year, we are very fortunate to have some of his caliber and experience to fill this vital academic leadership position while we conduct a national search for the next permanent dean of the college. Ghrayeb, who holds a PhD in Industrial Engineering from New Mexico State University, has been published in several international journals, is a senior member of Institute of International Education, and has attracted more than $2 million in funding for his research.